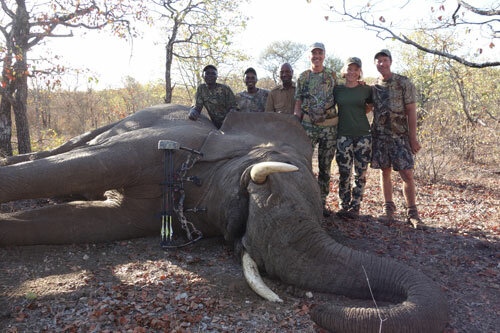 Bowhunting elephant is tough. Your life is on the line. It is the supreme test of the bowhunter - and his equipment. One of the most important assets you must have is confidence. You need confidence in yourself, confidence in your professional hunter, and confidence in your equipment. After all, what good is it if everything works out and you place an arrow exactly where you're supposed to, but nothing happens? If your arrow and broadhead combination can't get the job done, you're toast. The 1250 grain GrizzlyStik system has taken over 75 elephant that we know of. When our customers used the equipment we recommended - (if they were able to get the shot) they've had 100% success. That's what happens when you use the hard hitting, deep penetrating GrizzlyStik System. Think of it as the .500 Nitro Express of bowhunting. We highly recommend that you start with a GrizzlyStik 1250 Test Pack. It comes with two GrizzlyStik arrows, matched to your bow, with a total weight of 1250 grains. By testing this set up in advance - you will know how well these arrows fly for you before investing you the dozen or so arrows you'll want for your hunt. Momentum is a better indicator of arrow penetration than Kinetic Energy. 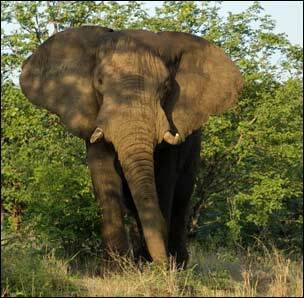 Your kinetic energy number is good to know, but for penetration, especially on an animal as formidable as elephant, you need to maximize your momentum - and it takes specialized gear to get you the kind of momentum you need for elephant. There are many factors involved in achieving optimum arrow performance. We have outlined them in an article called, the Top Twelve Penetration Enhancing Factors. Read it and you'll have a good understanding of what is important for optimum penetration and you'll know why the GrizzlyStik System works so well. If you'd like to dig into the science of arrow lethality we've posted all of Dr. Ashby's reports here. They're deep and detailed, but fascinating. The vitals are a large target on an animal of this size, but so are the bones. The ribs are massive, and you have a high probability of hitting one. Fortunately, our GrizzlyStik System has punched through and a couple times even split these big rib bones. Check out the pictures below - they show what kind of performance our customers have seen. 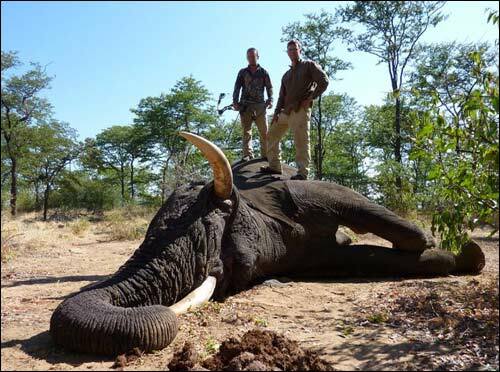 Click on any of them to see our "GrizzlyStik Success - Elephant & Hippo Photos" field photo trophy room to find out more details of the hunts. 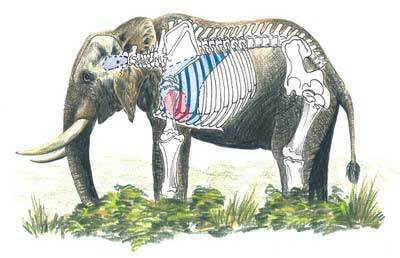 You need bows of at least 80# for elephant, and 1250 grain arrows with high FOC percentages. The GrizzlyStik Momentum 170 is the best arrow for the job.It has an ultra stiff spine, (.170 deflection) and because of that, this arrow can be shot from bows that are in excess of 100#. If you have a super fast, high-energy bow from 80# to 100#+, consider the GrizzlyStik Momentum 170. When weighted to 1250 or more grains these arrows are hard hitting marvels of penetration that's why we call them the .500 Nitro Express of bowhunting. Dr. Ashby challenged us to make our arrows lighter and stiffer because then more weight can be added to the front to maximize ultra-forward of center percentages. The Momentum TDT 170 is about 200 grains lighter in mass weight and about 75 points stiffer than our original GrizzlyStik Safari arrow, so you can add another 100 or even 200 grains to the front. By adjusting the internal weight adapters, you can achieve perfect arrow flight while increasing your forward of center percentage so your arrow can continue penetrating on big animals like elephant even after the heavy bone has been breached. There is no other arrow and broadhead system that comes even close to the performance of our GrizzlyStik system. 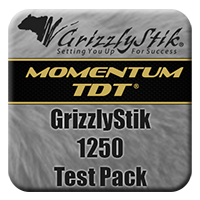 We have a proven formula for the GrizzlyStik Momentum TDT 170. Total weight must be a minimum of 1250 grains. The broadhead a solid one-piece forged - single bevel - GrizzlyStik Ashby or GrizzlyStik Nanook broadhead. 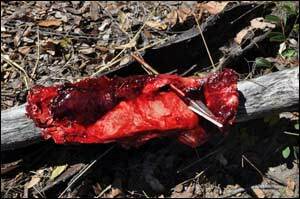 Ashby on the Single Bevel Broadhead's bone splitting advantage. The pictures below show you how we achieve the 1250 grains. 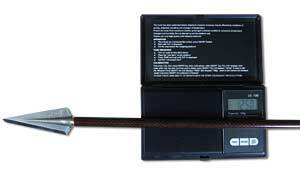 Note: We are showing stats for full length arrows - if your arrows needed to be cut to a specific length we would increase the additional weights up front to get you to at least 1250 grains. This is definitely a case of, "more is better." 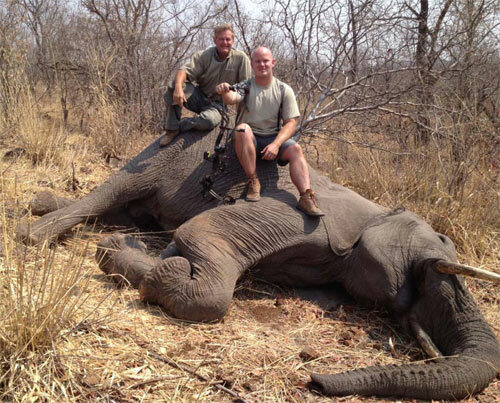 View all our GrizzlyStik Elephant & Hippo Success stories and testimonials.